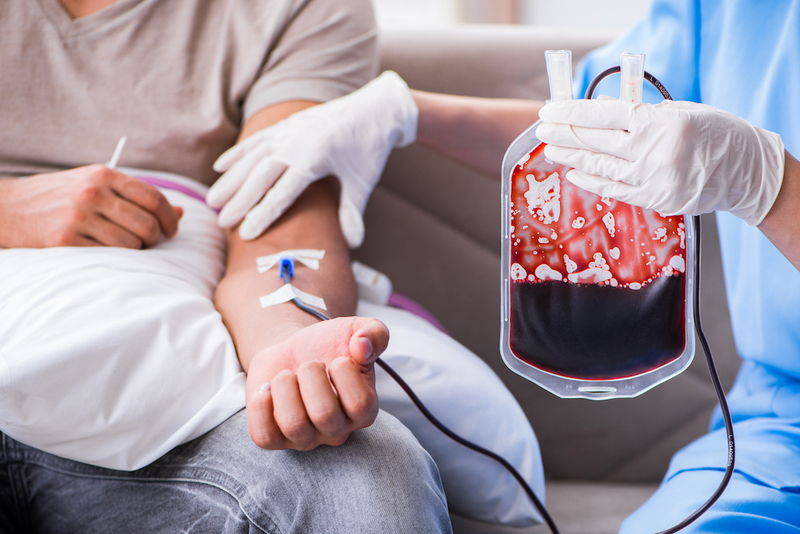 Some of the most common questions that our patients have prior to surgery are in regard to the possible need for a blood transfusion during the operation. 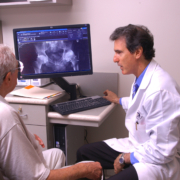 At the Leone Center for Orthopedic Care, we welcome such questions as part of our patient-care philosoply. We want you to fully understand all aspects of your surgery and be completely prepared before the procedure takes place. According to the National Heart, Lung and Blood Institute, U.S. Department of Health & Human Services, almost five million people in the U.S. require blood transfusions annually. The procedure is used for people of all ages, typically for severe injuries from accidents, critical illnesses and blood loss during surgery. One of the major changes that I’ve seen over the past few years is a highened insight or sensitivity that a transfusion is really a transplant of multiple living cells that we hope will function to deliver oxygen to the body’s tissues. We regard it as any other transplant. Is a blood transfusion always necessary during surgery? The answer is no. Actually, a much smaller percentage of our patients are transfused now as compared with several years ago. Modern surgical procedures, techniques and the medical community’s knowledge about the body’s need for replacing blood loss during surgery have changed. This current thinking has greatly reduced the need for transfusion. Previously it was thought that a transfusion was necessary if hemoglobin levels dropped below 10 g / dL (grams of hemoglobin in a deciliter of a blood sample). We now have the confidence to allow hemoglobin levels to drop as low as 7 or 8 g / dL before we consider a transfusion, as long as our patient clinically is tolerating the lower level and doesn’t have any other conditions which might raise the threshold, such as coronary artery disease. We now concentrate on increasing intravascular fluid or volume to maintain a feeling of vitality and blood pressure, and allow the body to naturally regenerate the lost red cells. Because our techniques are much more refined and most patients have their surgeries with regional (spinal) anesthesia, blood loss during surgery usually is minimal and much less than has been in the past. Instead, surgial patients are encouraged to increase their hemoglobin levels pre-operatively with iron supplements and a healthy diet. Occassionally, patients are directed to increase their pre-operative hemoglobin levels with Erythropoitin, a prescribed hormone that regulates red blood cell production. 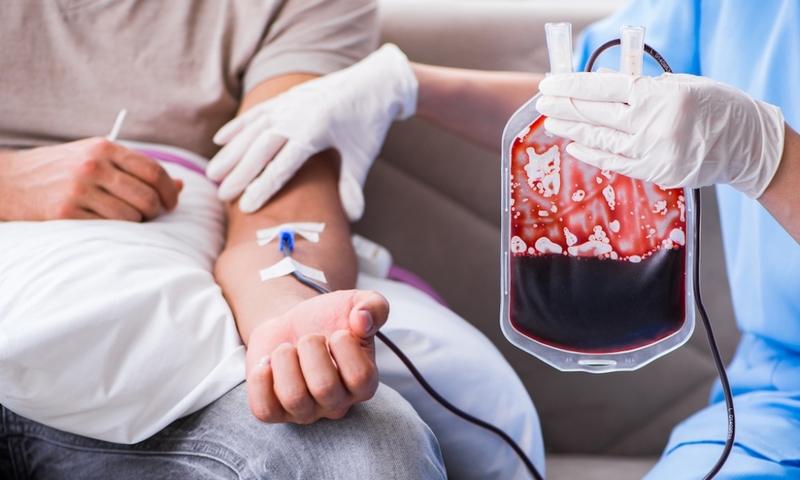 Is blood from a donor bank safe? The risk of AIDS or other viruses from a blood transfusion are very low. Because of the stringent screening and testing processes in place today, your chance of being transfused with blood that carries HIV is about one in two million, lower than your chance of being struck and killed by lightning. In spite of this low risk, it still is better to avoid a transfusion whenever possible from either a blood bank or from your own donated (autologous) blood. Are there benefits to donating your own blood for use prior to surgery? Historically it was thought that if you donated your own blood, then the cells within our bone marrow that make blood cells would be reveved up quickly to replace it. Now we realize that this is not the case as it takes six to eight weeks for your body to replenish one unit or pint of blood that you donate. Also, the general concensus used to be that being transfused with your own blood would be safer and more advantageous than blood from a blood bank. We now know that this is not necessarly true. The longer the cells that you donate are out of your body, the less well they will function in terms of delivering oxygen to your tissues. There also is a risk of infection, either from contamination during processing or delivery. Or, if you have any undetected bacteria during the donation, that potentially could cause an infection later during the transfusion. There still are certain indications or benefits in donating your own blood, but self-donatinon is much more selective than it was a few years ago. Donating your own blood can be costly, at approximately $700 per unit. Insurance does not always cover the expense. It’s also time consuming and there are far fewer places to donate now that it is done less frequently. What I see now clinically is that because so few patients donate their own blood, they are going into the operating room with much higher hemoglobin levels, further decreasing the need to transfuse. As you approach any surgery, it is most important that you feel confident in your surgeon and that all of your questions have been answered, so that you are fully prepared for the procedure. What date this article was published on?